If I were to ask our generation to name some of the veterans that they know in Philippine Showbiz, they would normally answer Gloria Romero, Dolphy (†), Eddie Garcia, Nora Aunor, Eddie Gutierrez, Vilma Santos and so on. Thus, if this is the category in a Family Feud contest, then I could probably say they are not able to guess the top answers in the survey! Because names like Katy Dela Cruz and Mary Walter should be considered. 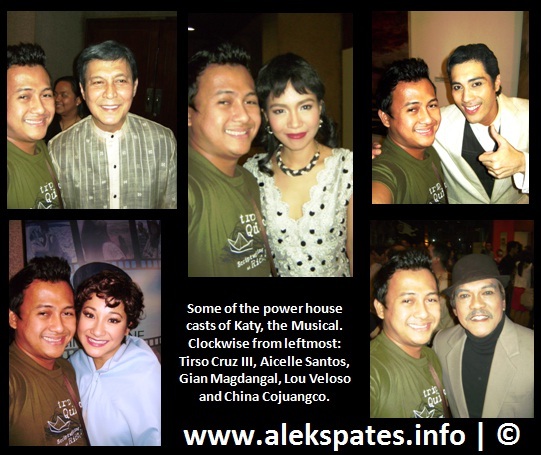 Last night, I’ve had the rare opportunity to watch the exceptional performance of the power house casts of the original Filipino Musical: Katy held at the Cultural Center of the Philippines, Tanghalang Aurelio Tolentino (Little Theatre), January 20. This was the 21st century version of the musical because the first original production was more than two decades ago (1988) wherein Mitch Valdez and Celeste Legaspi have played the role of Katy and Olivia, respectively. This time, it was the domineering performance of Isay Alvarez (the one who played the role of Katy) and Dulce (the one who played the role of Olivia) that nailed each of the scenes including Aicelle Santos who played the role of Katy when she was still a teenager. This was Aicelle’s debut performance in a musical theatre and I think her normal jazzy style in singing has flawlessly fit her into the role. 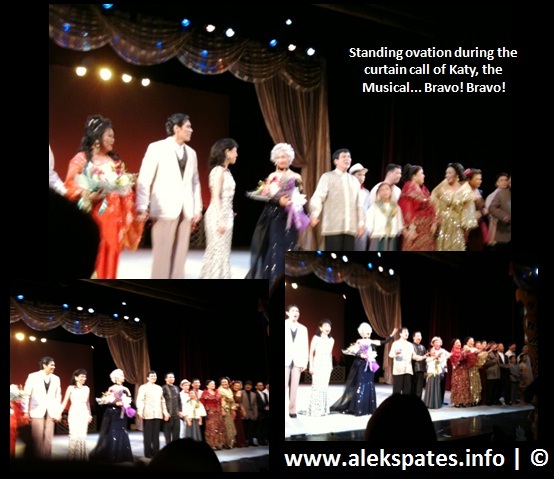 The musical play was about the colorful life and times of the Country’s Queen of Jazz and Bodabil, Katy Dela Cruz. It highlighted Katy from a child protégé singing in fiestas, cockpits, movie houses to Teatro Lux, Grand Opera House and later on San Francisco USA. I seated at the second row of the theatre so that I could absolutely feel the ambiance and the melodramatic moments of the show which unsurprisingly happened. The show didn’t fail to inspire me because I cried many times especially when Tirso Cruz III (the one who played the role of Katy’s father) was delivering and singing his lines. Maybe it was because he reminded me of my father and also, it’s because stage is part of my life as well. Actually, the show was not about that pure theatre thing but it’s all about the similar life-situation that could take place to any Filipino, the only catch there was that, it happened to a performer. Moreover, it happened in a different era. I’m not that old enough to know history but the show has let me traveled back to our past to take a glimpse on how our Filipino ancestors have sacrificed their lives to attain the freedom that we are currently enjoying. I experienced Goosebumps and tears! I’m an emotional type of person but I dare you to watch it because I bet you will experience the same thing. Unfortunately, Ms. Isay Alvarez and Ms. Dulce were not present at the lobby after the show. Of course, Katy and Olivia’s characters wouldn’t be remarkable without the almost perfected-performance of the following supporting casts: Gian Magdangal as Peping, Katy’s husband; Leana Tabunar as little Katy; Lou Veloso as director/manager of the theatre where Katy has worked; Tricia Jimenez, CJ Mangahis and Celine Fabie as Hannah, Patsy and Mary Walter, respectively; Epi Quizon as Dolphy; as well as the tremendous voices and gestures of the following Chorus namely Astarte Abraham, Andy Bais, Sheng Belmonte, Poppert Bernadas, JV Castillo, China Cojuangco, Aaron Ching, Nomherlito Cipriano, Gimbey Dela Cruz, Enteng Evangelista, Sheenly Gener, Neomi Gonzales and Carlon Matobato. This production was a great start for the Philippine theatre industry this 2013. Thus, it was made possible by the brilliant production team committee led by its executive producers: Robert Seña, Isay Alvarez, Tricia Jimenez and Carl Balita including Nestor Torre, the Stage Director and Mel Villena, the Musical Director. 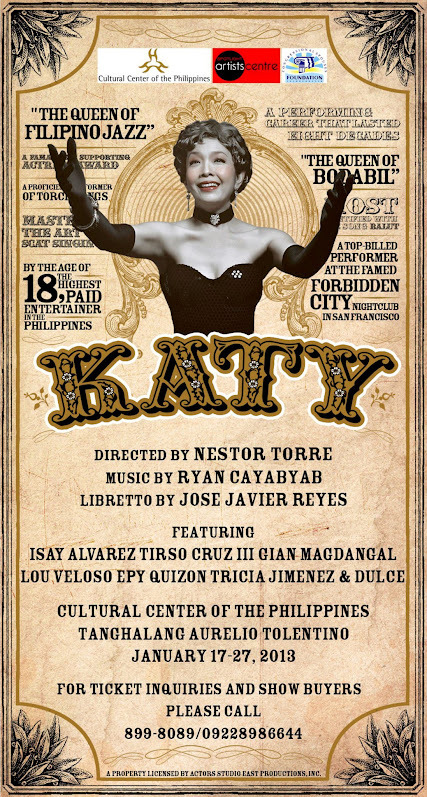 Katy, the Musical is based on the music of Maestro Ryan Cayabyab and original libretto written by Jose Javier Reyes. 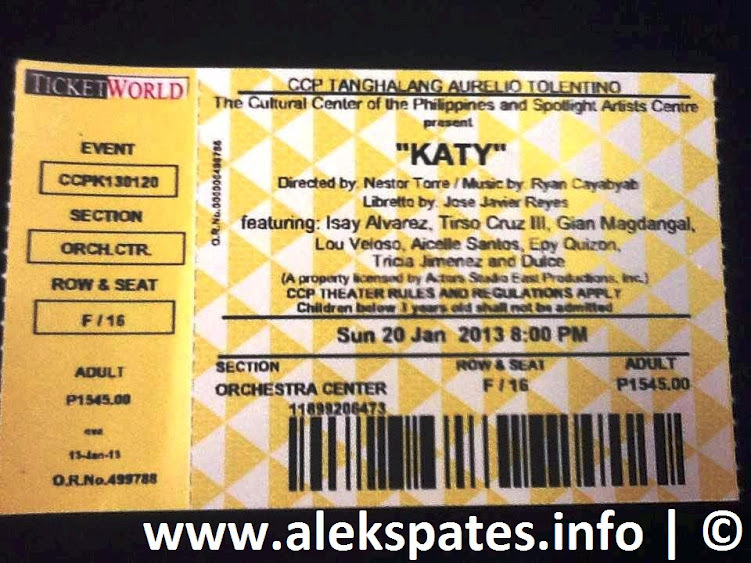 Do not miss your chance to watch Katy, the Musical! The show will run from January 17-27, 2013 at Tanghalang Aurelio Tolentino (Little Theatre), Cultural Center of the Philippines. For ticket inquiries and show buyers, please call 899-8089, 891-9999 or 832-1125. I cannot explain more of the awe-inspiring success of this production because the tears that I’ve cried when I watched it were in fact the proof of its victory.